We are proud that Turack Chiropractic is the first clinic to employ the Vitality REFRESH 24-Lamp Tanning Bed for light therapy patients in Wexford, PA. 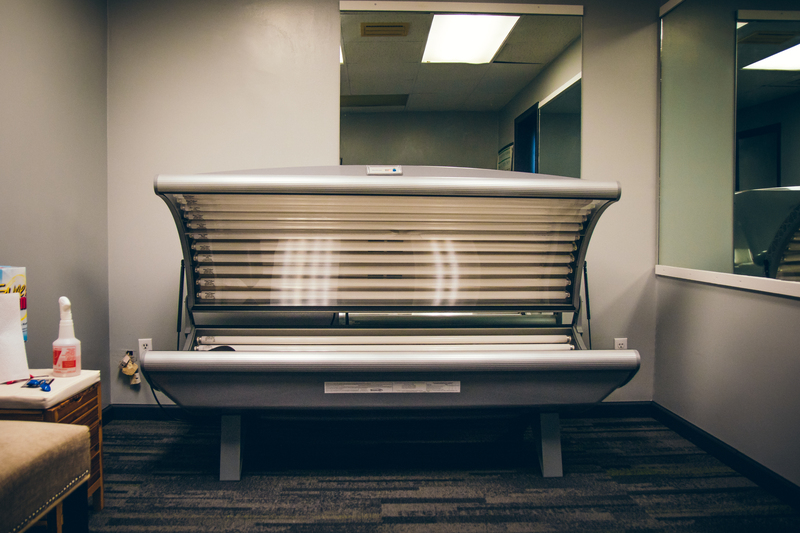 While sunless tanning beds are usually associated with desire to look good, they’re also useful when it comes to feeling good. You can go all the way back to ancient Egyptian and Greek civilizations and find that light in various forms has been used with the intent to heal the body and mind. In fact, the absence of sunlight has been linked to multiple diseases and mental conditions. It’s been long known that SAD (Seasonal Affective Disorder) and bone diseases like rickets and osteoporosis are linked to reduced exposure to sunlight. It’s all a matter of Vitamin D deficiency. To achieve optimal Vitamin D levels, we need daily exposure to sunlight. Vitamin D deficiency is one of the most under diagnosed conditions in the world. A quarter of the world’s population is believed to have a severe Vitamin D deficiency. Many others have insufficient levels low enough that researchers believe their overall health is still compromised. The health risks may not end at depression and poor bone health. More studies are linking Vitamin D deficiency to conditions such as obesity, high blood pressure, diabetes, multiple sclerosis, and possibly heart disease and cancer. So, It’s Time to Get Out in the Sun, Right? Truth is, unless you work outdoors all day, or live in a climate where clouds are few and far between and there is year-round sunshine, most of us can’t rely on sunlight alone for enough Vitamin D. And, let’s face it; we’re in Pittsburgh where the rain and grey skies are enough to depress even a Seattle transplant. Not to mention there is a very real and rational fear of skin cancer that has us rubbing sunscreen into any inch of skin we expose to sunlight – reducing the body’s ability to produce Vitamin D when the sun meets the skin. This is why sunless tanning and light therapy are being studied as an alternative to treat everything from depression to the eating disorder bulimia, insomnia, obsessive-compulsive-disorders, premenstrual syndrome or PMS, Parkinson’s Disease, jet lag, dementia, and attention deficit hyperactive disorder (ADHD). Additionally, Western medicine is also beginning to embrace light therapy as a drug-free alternative to treat sports injuries, back, neck and muscle pain, TMJ, fibromyalgia, arthritis, and carpal tunnel syndrome. Our Wexford chiropractic office has used light therapy to help patients in the Cranberry/Greater Pittsburgh region to reduce pain, inflammation, and swelling while accelerating healing and regaining mobility and range of motion. And, sure, we’ve also helped plenty of clients simply look and feel better as well. No shame in that. Our commitment to this effective and very promising non-invasive alternative treatment can be seen in the state-of- the-art equipment we use at our clinic. From the FDA approved Class IV medical deep tissue laser we use to the introduction of the Vitality REFRESH 24-Lamp Tanning Bed for sunless tanning in Wexford. It is among the best available locally and we’re always on top of the latest advancements. Contact us today to learn more about our Wexford light therapy and chiropractic services. Your body requires some exposure to beneficial ultraviolet (UVA and UVB) rays every day to help achieve your optimal wellness and support youthful-looking skin. And the red light lamps in this unit provide light in the 633 nm range to support your skin and help reverse the appearance of aging. Plus, you also get blue light in the 417-419 nm range to help give your skin a healthy appearance. This Vitality Refresh 24 Bed contains 24 lamps (12 in the overhead canopy and 12 on the lie-down bench). The canopy lamps contain both tanning lamps and the highly specialized red light feature. The bench lamps contain tanning lamps and the pain-easing infrared bulbs. Plus, the additional lamps are able to reduce your tanning time by 25%.